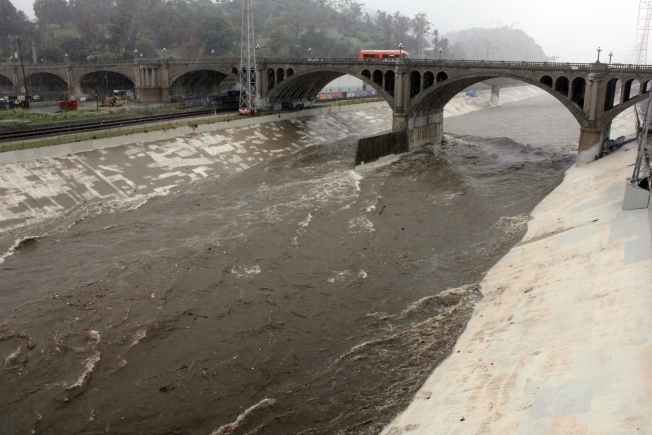 In downtown Los Angeles alone, 18.5 inches of rain has fallen since Oct. 1. January and February brought enough precipitation to boost the Eastern Sierra snowpack and rainfall in Los Angeles to well-above-average numbers, replenishing local groundwater aquifers through the capture of at least 18.4 billion gallons of stormwater, the Department of Water and Power announced Wednesday. The billions of gallons of captured stormwater has replenished aquifers with enough water to supply 170,000 L.A. homes for one year, according to the LADWP. "Just letting this water rush out to the ocean is a missed opportunity we can't afford. Instead, we want to collect and store more stormwater in local spreading grounds, to help the city increase our local water supply resources," LADWP General Manager David H. Wright said. "On a large scale, this means a massive investment of resources in regional stormwater-capture projects, groundwater cleanup and replenishment, recycled water and conservation programs which are critical to ensuring L.A.'s water future." According to LADWP, more than $2.4 billion in investments are planned over the next 10 years in water system infrastructure improvements, including local water supply development projects to increase the amount of stormwater capture. "For decades, LADWP has led the way in defining what a water-efficient city should look like, continuously raising the bar for what's achievable," said Richard Harasick, LADWP senior assistant general manager of the water system. "We welcome this wet winter, but we cannot count on it next year or the year after that. LADWP continues to stay committed to investing in expanding local water resource programs that take stress off of our Los Angeles Aqueduct supplies and ensure a more reliable water supply for future generations."